The Lamy Studio is can be seen as a possible 'next step' for the pen enthousiast that outgrew the Lamy Safari, or for those that just want to expand their collection. 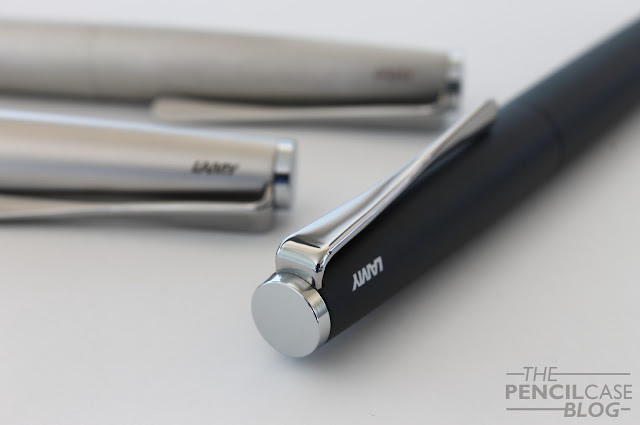 It's a pen that is actually seriously underrated in my opinion, since it's one of the most flexible products in the Lamy catalog, with varying finishes at different price points, it offers something for everyone. 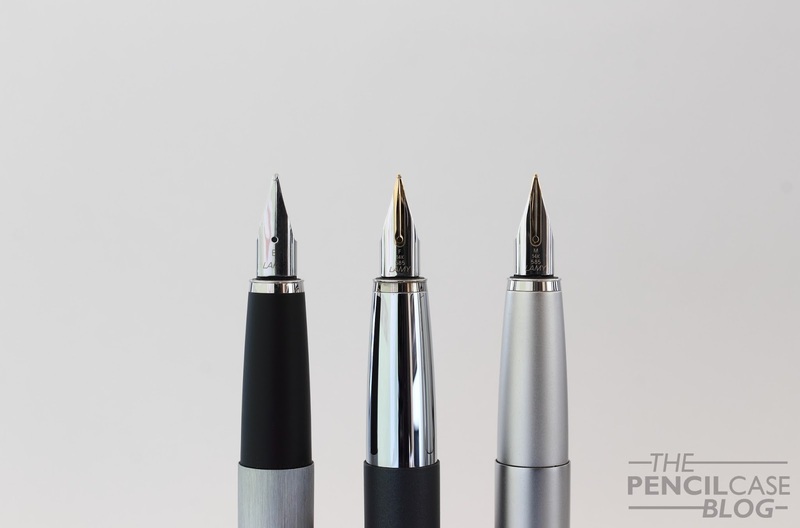 The Studio is a simple flattop pen, no bells and whistles for the most part... Apart from one distinct design feature: the unique 'propeller-style' twisted clip. It's a simple but beautiful aesthetic detail that defines the entire pen. Apart from looking good, the clip also functions quite well. It ends in a nicely rounded circular shape, which makes it easy to clip onto something. Right next to the clip, you can find a small laser-engraved logo. Lamy's minimal branding (apart from that on the Safari and Al-Star) is something I always enjoy seeing. It's very unobtrusive, and I actually like the way it looks, in contrast to some pens where I think the branding disturbs the design. At 14cm closed, and 12.6cm open, the Studio falls in the standard size range. The weight of the pen varies slightly depending on what version you get. 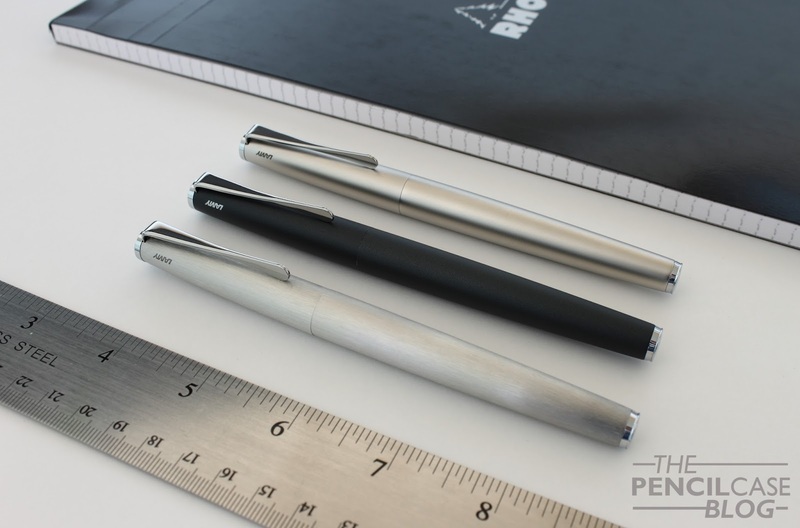 The entry-level brushed steel version weighs only 25 grams total, other versions come in slightly higher at 31 grams. 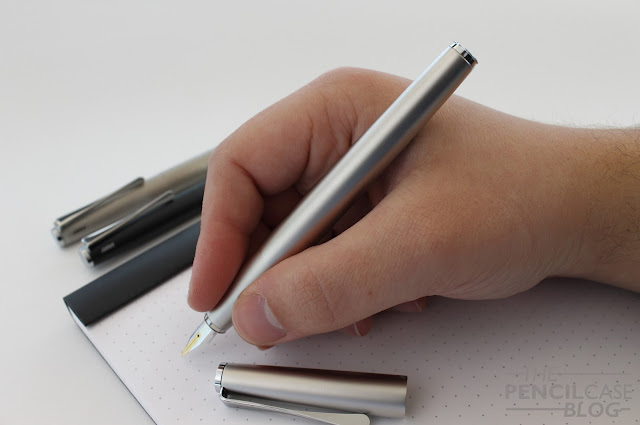 It's a decent standard sized pen that can be used comfortably without posting. The finial on the back of the barrel has a slight ridge, which allows for the cap to be posted securely, although I personally find it shifts the balance a bit too much towards the back. 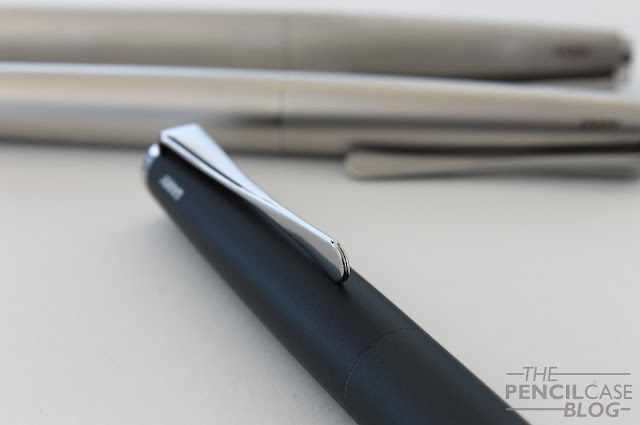 I personally find this one of the most comfortable pens Lamy makes, apart from maybe the macrolon 2000. But experiences regarding comfort vary quite wildly if you read different reviews. It all depends on one thing: the grip section! With this in mind, I'd personally recommend getting the cheapest version, the brushed steel. The rubberised section is comfortable and grippy, and it's actually the most affordable option. It's a bit unfortunate that they don't offer the rubberised grips on all the colors and finishes, so you'll have to take it into account when you're making a choice. On to the nib. Here you'll also find some differences, depending on which finish and color you choose. The brushed steel, matte black and imperial blue finishes all come with steel nibs, but the palladium and Platinium versions come standard with a 14k gold nib. Again, these configurations are as-is, so you can't get a blue version with a gold nib, or a palladium version with a steel one, but you can buy nibs separately and swap them out yourself. The nibs, both steel and gold, are excellent writers. 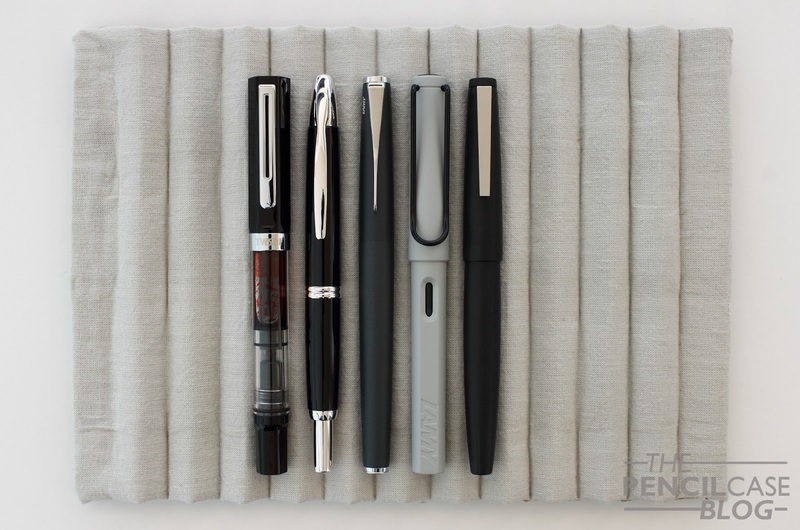 I'm a fan of Lamy nibs -let's make that clear-, they write consistent and smooth, and they are usually well-tuned. The gold nibs have a slight edge in my opinion, because they have a little softness to them, which gives some bounce when you write (don't expect much line variation though!). 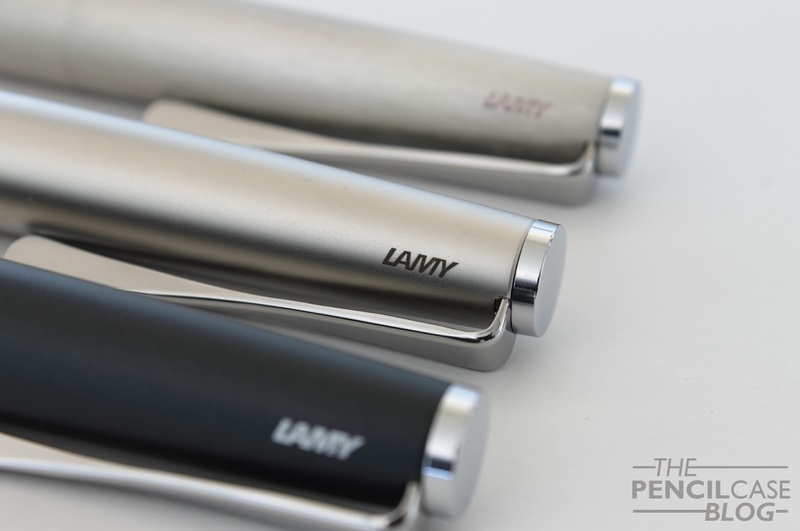 As I said in the beginning of this review, the Lamy Studio is a pen with a lot of potential. Prices start at 47.5 EUR (71.2 USD) for the brushed steel version, and go up from there. For the Palladium version with gold nib, you'll pay around 170 EUR/ 160 USD. The Platinium version, which is quite hard to find, sits somewhere in the 200+ range. In such a wide price range, you'll easily find something that suits you most. Great review! It's interesting, thorough, makes excellent points, and is beautifully photographed. It also shows your perfect pen grip - something I cannot duplicate and wish I could. Thank you for your post! Thank you so much! Your pen grip is something personal, and you should totally go with what works best for you! An extremely interesting blog! I enjoy reading your blog because I have a lot of friends-writers who work for handmade writings. When I sent them a link to your blog, they were amazed! Interesting reviews, qualitative photos and nice style of writing.